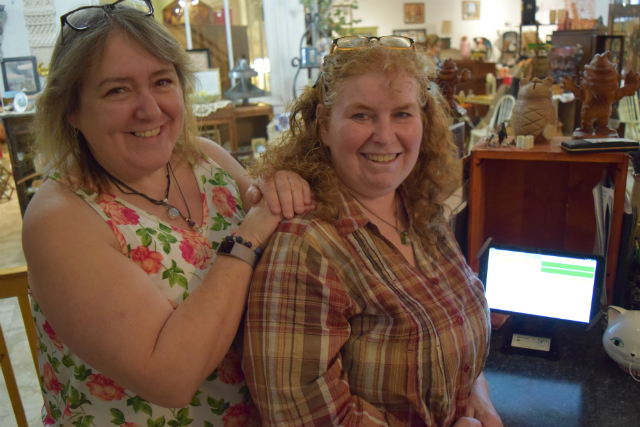 Wendy Zimmer and Janet Mueller have been collecting antiques and treasure hunting all their lives. “You pretty much fill your house until it explodes or open a shop, so we opened a shop,” said Mueller. They called it Old Koots. When they out grew that location, they looked into finding a bigger space. At almost 4,000 square feet, the new space, which was a pub, hotel and hostel for over 80 years, was more than they needed. To make it work, they brought in 12 other vendors and four artists to provide unique items like beautiful handcrafts, up-cycled furniture, vintage local art and “other fabulous crap”. With that many vendors, “There are so many cool things that come in and out of here,” said Zimmer. Old Crow Emporium opened on July 1st with thousands of antiques and collectibles. “Fun, funky, old and junky; if its any of those four things we’ll take it,” said Mueller. “The love of everything old. The history of items, the smell of old books,” drew Zimmer to collecting. They have both seen a lot of changes in collecting over the past 40 years. Zimmer and Mueller find that Millennial women are really into old Pyrex dishes. As for the future of the Emporium, there are plans to serve light lunches and provide more baking this Fall. Small craft classes of six to eight people will also be held, for example, how to make felted animals or bees wax food wrap. They also have plans for more themed events, i.e. Christmas, where four or five specialist vendors will be invited to set-up in the Emporium for a short time. Zimmer heard about POS-n-go from other store owners. She and Mueller checked it out and are glad they selected POS-n-go for the Emporium’s POS. “We love it, it’s so easy,” said Mueller. Despite the learning curve, they both found POS-n-go straight-forward to learn and use. “If these old crows can use it, anybody can,” said Zimmer. Next time you have the urge to smell old books or see a part of history, check out the Old Crow Emporium, on the Platzl in Kimberley.